Define a front-end to the STL "vector" container that conforms to the IndexedContainerInterface. This is a full-fleged Object, so there is modification time, debug, and reference count information. TElementIdentifier An INTEGRAL type for use in indexing the vector. TElement The element type stored in the container. Definition at line 51 of file itkVectorContainer.h. Definition at line 60 of file itkVectorContainer.h. Definition at line 64 of file itkVectorContainer.h. Definition at line 63 of file itkVectorContainer.h. Definition at line 59 of file itkVectorContainer.h. Definition at line 57 of file itkVectorContainer.h. Definition at line 69 of file itkVectorContainer.h. Definition at line 93 of file itkVectorContainer.h. Definition at line 58 of file itkVectorContainer.h. Definition at line 71 of file itkVectorContainer.h. Definition at line 70 of file itkVectorContainer.h. Quick access to the STL vector type that was inherited. Definition at line 68 of file itkVectorContainer.h. 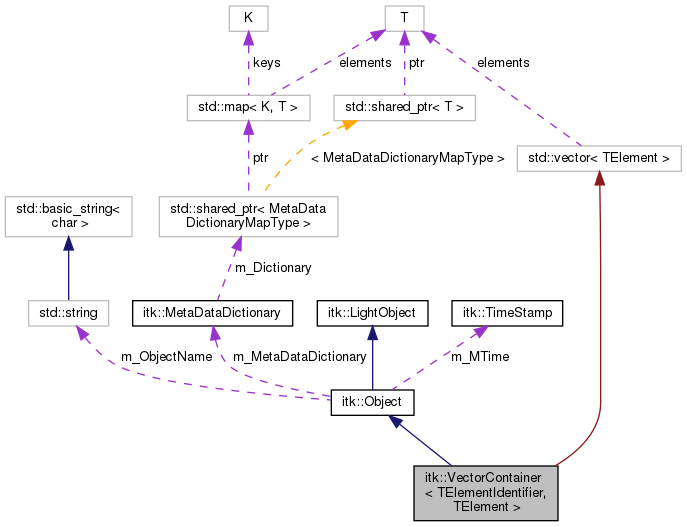 Provide pass-through constructors corresponding to all the STL vector constructors. These are for internal use only since this is also an Object which must be constructed through the "New()" routine. Definition at line 77 of file itkVectorContainer.h. Definition at line 79 of file itkVectorContainer.h. Definition at line 81 of file itkVectorContainer.h. Definition at line 83 of file itkVectorContainer.h. Definition at line 86 of file itkVectorContainer.h. Get a begin const iterator for the vector. Get a begin iterator for the vector. Definition at line 112 of file itkVectorContainer.h. Definition at line 106 of file itkVectorContainer.h. Get a reference to the element at the given index. If the element location does not exist, it will be created with a default element value. It is assumed that the value of the element is modified through the reference. Make sure that the index range of the vector is large enough to allow the given index, expanding it if necessary. The index will contain the default element regardless of whether expansion occurred. Delete the element defined by the index identifier. In practice, it doesn't make sense to delete a vector index. Instead, this method just overwrite the index with the default element. Get a reference to the element at the given index. It is assumed that the index exists, and it will not automatically be created. Get an end const iterator for the vector. Get an end iterator for the vector. Read the element from the given index. It is assumed that the index exists. Check if the given index is in range of the vector. If it is not, return false. Otherwise, set the element through the pointer (if it isn't nullptr), and return true. Standard part of every itk Object. Reimplemented in itk::PriorityQueueContainer< TElementWrapper, TElementWrapperInterface, TElementPriority, TElementIdentifier >. Check if the index range of the vector is large enough to allow the given index without expansion. Clear the elements. The final size will be zero. Set the element value at the given index. If the element location does not exist, it will be created with a default element value. Tell the container to allocate enough memory to allow at least as many elements as the size given to be stored. In the generic case of ITK containers this is NOT guaranteed to actually allocate any memory, but it is useful if the implementation of the container allocates contiguous storage. In the particular implementation of this VectorContainer the call to this method actually allocates memory for the number of elements defined by ElementIdentifier. Set the element value at the given index. It is assumed that the index exists. Get the number of elements currently stored in the vector. Tell the container to try to minimize its memory usage for storage of the current number of elements. This is NOT guaranteed to decrease memory usage. This method is included here mainly for providing a unified API with other containers in the toolkit. Definition at line 165 of file itkVectorContainer.h. Definition at line 164 of file itkVectorContainer.h.